What our dentists think about having wisdom teeth removal? What if I'm really nervous about having my wisdom teeth removed? Don't worry, at the Cosmetic and Laser Dentistry Centre, we understand your anxiety and our whole team are well equipped to make your experience as calm and pleasant as possible. 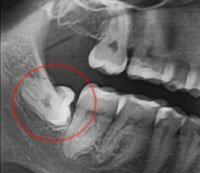 During your wisdom tooth consultation you can discuss the different options and techniques that are available to ease your nerves. These can range from taking a sedative tablet 1 hour before surgery to make you feel more relaxed, to having a general anaesthetic so that you are asleep through the whole procedure. They are removed for a number of reasons, but usually because they are “impacted” which means they have not erupted properly and have become stuck against either another tooth or your jaw bone. This can create an area where food and bacteria get trapped and create problems such as decay, bad breath and infections. They can also be removed for orthodontic reasons. When should I have my wisdom teeth out? It is advisable that once a problem with your wisdom teeth has been indicated to you by your dentist, that you have them removed. Waiting for symptoms to arise is often a mistake as decay may affect multiple teeth before you realise there is a problem. Infections of the gum over impacted wisdom teeth, known as pericoronitis, can be nasty and result in a lot of pain and even facial swelling. Is having my wisdom teeth removed painful? The process of having your wisdom teeth removed is usually performed under local anaesthetic which makes it pain-free. After the surgery, your body will react by swelling in the area. This is your body's way of increasing the blood supply in the area to send more nutrients to the site in order to start the body's natural healing mechanism. This swelling usually lasts for 3 to 5 days, but the amount of swelling varies from person to person. Pain medication is prescribed after surgery which, if taken as directed, will ensure a practically pain-free recovery. Peoples recovery times vary, but usually 3 to 7 days is a good estimate. By taking regular painkillers for the first 3 days after surgery, this usually means you are pain-free during this time. Depending on how physically active your job is, you may be able to return to work the next day, but it is usually a good idea to plan a quiet few days after your surgery.